When it comes to holidays and birthdays, it's not about buying, it's about buying. Amy Heinz is a mom of three, freelance copywriter, and the blogger behind Using Our Words. In our family, there's no question about it -- I'm the holiday shopping Scrooge. 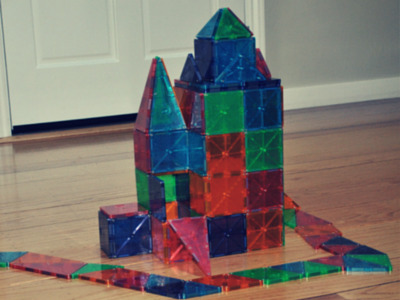 I'm the no-fun parent who begs relatives not to buy our kids more toys -- especially big ones. I'm the practical one who removes things from the online carts that my generous husband creates. I'm the grump who thinks that our kids already have more than enough, so I just can't wrap my head around buying the latest and greatest things our kids must have at any given moment. But that's the key, I've come to realize after speaking to my favorite independent toy store owner, Anna Chow. When it comes to holidays and birthdays, it's not about buying more, it's about buying smart. I couldn't help but hear, "Guilty!" echo through my head when Anna pointed out a couple alarming trends in the world of toys. The first is that parents see toys as "stuff" that's simply cluttering the house. (Um, yes.) "That's a sign that people are buying just to buy, and not thinking about toys as tools for learning and development." She also says that a lot of people will go into brick-and-mortar stores to get great ideas from the staff and see items in person, but then buy from big online retailers to save a few dollars. (Who me?!) But if we aren't willing to pay a bit more for the value of the in-store experience and personal service, these shops simply won't stay in business. So, what's this toy guru's advice when it comes to holiday shopping? "You know those 'Top Ten Hot Toys' lists? Ignore them! Each child is different, and, while those lists are a tempting short cut, with a little more thought you can find the perfect gift that will last." Is this a toy that will grow with the child? How many different ways can the child engage with it? How will the child play with the toy as he/she gets older? What ways can a caregiver add play value to the toy? How well is the toy made? How will it stand up to normal play? How much imaginative input does the toy encourage? What developmental milestones does the toy address -- cause and effect, sensory exploration, negotiation with peers/siblings, fine- and gross-motor development, spatial relationships, etc.? Are there additional pieces or items that can be added on for further play value? What is the child drawn to or does the child have an affinity for--building things, objects with wheels, painting, etc.? What unique alternatives does your local, independent toy store recommend? So, chime in. What toys are on your family's Top 10 list? Why? Amy Heinz is a San Francisco Bay Area mom of three and the writer behind Using Our Words -- a parenting blog filled with lessons she's learned (usually the hard way), laughs she's enjoyed (mostly at her own expense), and tears she's shed (this mama's got heart). You can also find her on Facebook and Twitter.